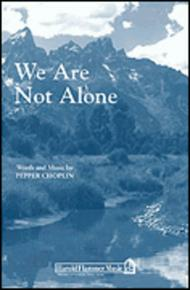 We Are Not Alone composed by Pepper Choplin. For Choral (SATB). SATB choir, a cappella. Harold Flammer. Sacred. 8 pages. Shawnee Press #A7924. Published by Shawnee Press (HL.35025075).This anthem touches the heart with its reassuring message of God's faithfulness and power. The choir supplies rhythmic energy with its repetitive phrase, “We Are Not Alone,” while the soloist glides above in smooth sustained lines. The piece will leave the congregation singing this simple but profound truth long after the service has ended.